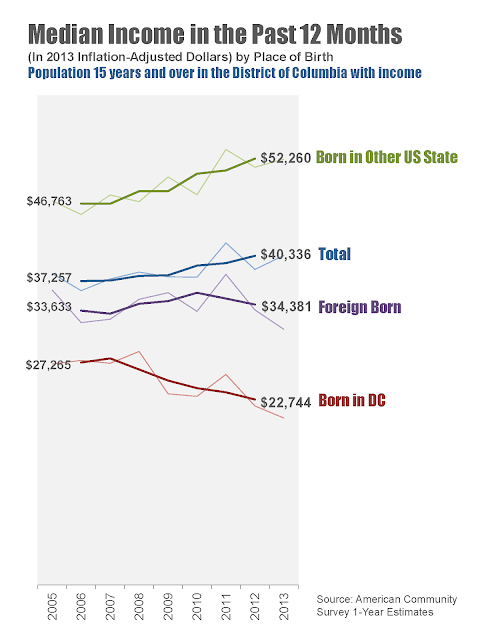 Between 2006 and 2012, incomes for DC residents born in another US state increased by approximately 12%. But for people born in DC, they decreased by more than 16%. A rising tide, it turns out, will not necessarily lift all boats. Some argue that the construction and service sector jobs brought on by the city's economic development will help compensate for the increased cost of living. But depressingly, the data below show that District residents who were born in DC are actually bringing in less income than in the past, despite a general upward trend in income for other groups. On the surface, it's easy to say that life is good for the District: Families have earlier access to public education for their children and DC's schools are getting better, there are more transportation options and full-service grocery stores, crime is falling, and city's new recreational and civic amenities are amazing. In the face of the rising housing costs stemming from all this increased desirability, the truth remains: if you don't make enough money, it's hard to get by in DC.